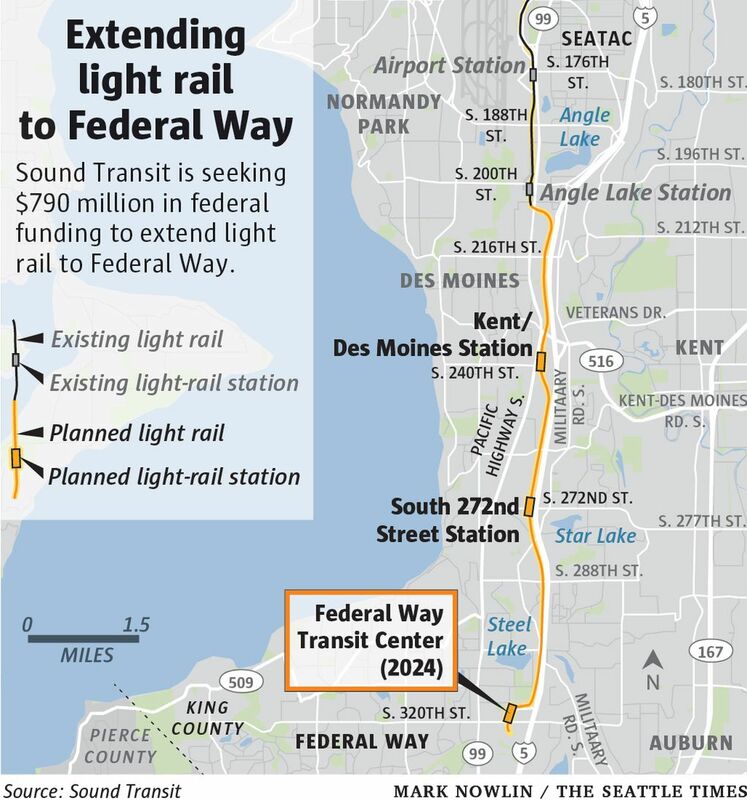 The federal government has given Sound Transit early approval for extending light rail to Federal Way, indicating hundreds of millions of dollars in grants could be on the way, Sound Transit announced Wednesday. The Federal Transit Administration (FTA) approved moving the project into the engineering phase of the government’s funding process, making way for Sound Transit to seek $790 million in federal funding for the project. The funds, about a quarter of the project’s total budget, would come over multiple years and still have to be formally granted by the federal government. Sound Transit CEO Peter Rogoff said he received the news in a phone call with FTA Acting Administrator K. Jane Williams on Tuesday evening. Rogoff, who himself served as FTA administrator during the Obama administration, said the move hints at likely federal funding. While Sound Transit regularly budgets for federal grants, the prospect of such grants has been uncertain under President Donald Trump, who has proposed slashing transit grants. Congressional budgets have maintained the grant programs, though, and last fall the administration agreed to provide $1.2 billion for Sound Transit’s extension to Lynnwood. Washington’s congressional delegation lobbied for that funding to Lynnwood. In statements Wednesday, U.S. Sens. 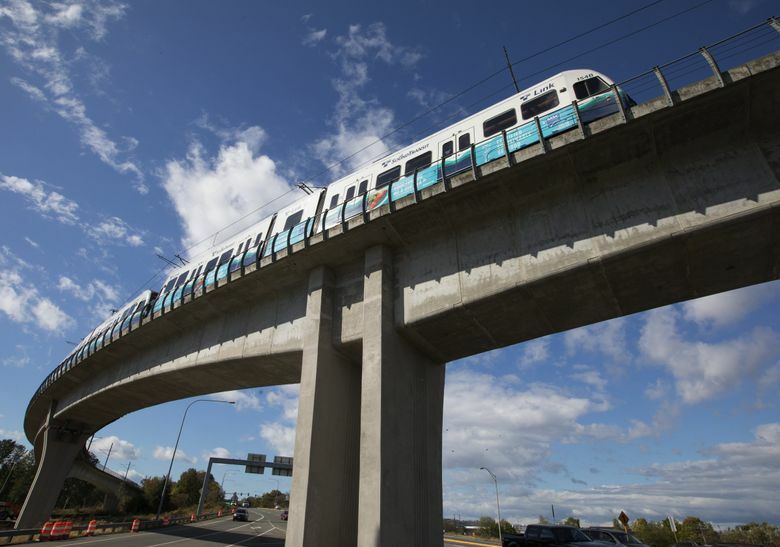 Maria Cantwell and Patty Murray both called the Federal Way line a “critical” investment. The planned extension from the current end of the line in Angle Lake south to Federal Way has suffered both because of the Great Recession and the region’s hot economy. The line was originally planned to open in 2023 as part of the ST2 ballot measure voters passed in 2008 but was delayed by the recession. As part of the latest voter-approved measure, ST3, Sound Transit now promises trains will reach downtown Federal Way by 2024. The 7.8-mile line will have three new stations and carry 36,500 daily riders by 2035. Last year, Sound Transit announced the project would be over budget by $460 million, blaming construction and land costs, and set the project budget at $2.45 billion. This year, Sound Transit said federal policy changes required even more contingency funds for the project and bumped the total budget again to about $3.16 billion, including the purchase of 20 trains. Rogoff said in March “it is our sincere hope and expectation that we will not spend much, if any, of that” extra contingency funding. To keep the project on its current planned timeline, Sound Transit needs to secure federal grant funding by the end of this year. The agency plans to start demolition and utility relocation this fall.